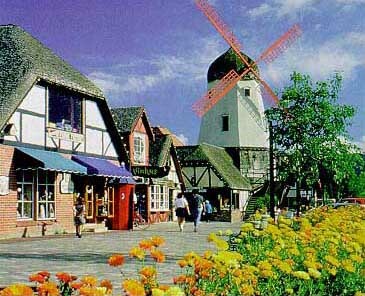 Solvang is an all-in-good-fun slightly hokey, homey Danish American town affectionately referred to as Little Denmark. European farm-style buildings line the colorful flower-filled streets, and authentic Scandi bakeries,(I loved the “kringles” almond paste filled racetrack shaped pastries but was not so big a fan of the overly-sweet “aebleskiver,” fried pancake balls ladled with raspberry jam and powdered sugar ) windmills, art galleries, shops and wine tasting rooms lend it old-style flavor. Granted it’s touristy, yet it’s spread out enough so you never felt packed in by other day-trippers. When you’re shopped out, you can tour a lavender farm, visit an alpaca or ostrich farm, goggle at the mini-Shetland horses, do a little hiking and biking, or just eat and sip the day away. 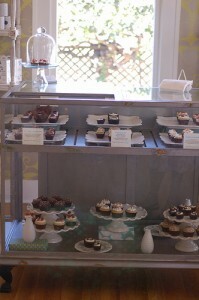 A fave stop was the laid-back artsy community of Los Olivos, liberally sprinkled with tasting rooms. Carina Cellars wine exemplifies the best of Santa Barbara’s wine making talent and terroir. One of the most unique pairings can be found at Saarloos & Sons , located in a sprawling bungalow at the end of town with a vintage 1964 Shasta trailer parked out front. Here you can taste “the best wine you’ve never heard of” which is bound to change soon since owner, Keith Saarloos, is passionate about producing only amazing wines. We loved the story and the flavor of their Purper Hart, a rich ruby-red Syrah named after their uncle who lost his life in WWII. But back to the pairing–Located inside the winery is a new bakery, Enjoy Cupcakes specializing in Saarloos wine flavored cupcakes. Licking the blackberry frosting off their signature Chocolate Blackberry Syrah cupcake filled with dark chocolate belgium fudge, while sipping a little Purper Hart—well it just doesn’t get much better. For an alcohol –free tasting pop into Global Gardens where the gregarious owner Theo Stephan will guide you through a sampling of her EVO’s and fruit-infused vinegars and many other locally grown home-made specialties. Her products are all beautifully packaged and perfect for gift-giving. Just time for a quick change and then we skootched one town over to the Ballard Inn Restaurant, a romantic little jewel tucked away in the charming little township of Ballard. No recession woes here, all 12 tables were occupied the night we were there. 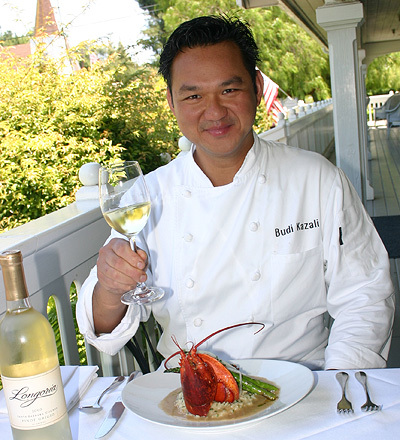 A celebratory mood was in the air as Chef Budi Kazali had recently been named Central Coast Magazine’s Ultimate Chef for 2009. His impeccable melding of French/Asian cuisine put me in mind of a recent meal at Campton Place – one of my faves in SF. Once again my food antennae comes through- our gracious server told me that yes, indeedy, Chef had hung his toque in Campton’s kitchen a while back, as well as Restaurant Gary Danko’s and the James Beard Award winning Blue Ginger with Chef Ming Tsai. Pristine fresh ingredients, an elegant yet casual vibe, a variety of local vintages paired with gorgeously crafted food presos make this a place you’ll want to reserve in advance for a special evening. The menu often changes but if Chef Budi’s New Style Hamachi Sashimi with Avocado & Soy-Yuzu Vinaigrette or Red Roast Kurobuta Pork Belly with Napa Cabbage Fondue are still available, order both. Added Value: No designated driver necessary. After a full up meal of good food/libations you need only weave a few short steps to your “room at the Inn” to sweetly sleep it off. We stopped over at Solang on a fine spring morning in 2007. We tasted some cupcakes, bought some chameleon,( color-changing), t-shirts, walked along the flower laden Scandinavian style houses some sporting windmills and reluctantly embarked on our way back to Fremont. Thanks for a cute post which brought back a happy trip back to me. This sounds like one heck of a birthday bash! Solvang is such an adordable city and I’ve never been to Ballard but always heard high praise of it so I might have to make the trip and check it out. I’m a big wine taster of the area so I’m always up in the hills of Santa Barbara. Great times! I have to get back to town eventually-summer time hopefully! Stay at the Sandman Inn (www.thesandmaninn.com). Right in downtown Santa Barbara and beyond affordable. Well worth checking out!